BJD will have 33% women candidates in Odisha’s 21 Lok Sabha seats, while Trinamool Congress has upped the figure to 41% for Bengal’s 42 seats. ThePrint Essential — our new product in which we make sense of the big, complex developments of the day and what could happen next. When there is so much news, and everybody in the media covers it the same way, using the same jargon, focusing on the marginal and skirting the essential, you need The PrintEssential. They are quick notes from ThePrint’s domain specialists, who bring the what, where, why and how of the issues and debates of the day. New Delhi: Close on the heels of the Biju Janata Dal’s decision to put up 33 per cent women candidates for the Lok Sabha elections in Odisha’s 21 seats, the Trinamool Congress Tuesday announced it was allocating 41 per cent of West Bengal’s Lok Sabha seats to women candidates. The parties have thus increased the pressure on others to follow suit. Senior Congress leader P. Chidambaram tweeted Wednesday that if elected to power, the party would pass the women’s reservation bill — which proposes to provide 33 per cent reservation in Parliament and state legislatures — in the very first session of the 17th Lok Sabha. The Congress also announced that it would reserve 33 per cent of all posts/vacancies for women in the central government, its organisations and Central Public Sector Undertakings. ThePrint examines the background to the current moves to implement reservation for women. Will it be lip service again? The bill was first introduced by H.D. Deve Gowda’s United Front government in 1996. However, the fact that it still awaits passage through Parliament is proof enough that political parties haven’t been serious about it. The bill was re-introduced in 1998, 1999, 2002, 2008 and 2010. In fact, the Rajya Sabha passed it in 2010. However, major parties including the Rashtriya Janata Dal and the Samajwadi Party had opposed the bill, so it could not be taken up by the Lok Sabha. The bill lapsed when the 15th Lok Sabha’s term came to an end in 2014. In the 16th Lok Sabha that concluded in February, the ruling National Democratic Alliance made no attempt to table the bill. In 2016, the then-union law minister D.V. Sadananda Gowda had given a written reply in the Lok Sabha, where, without specifying a time frame, he said political parties need to reach a consensus on the bill before it is introduced. 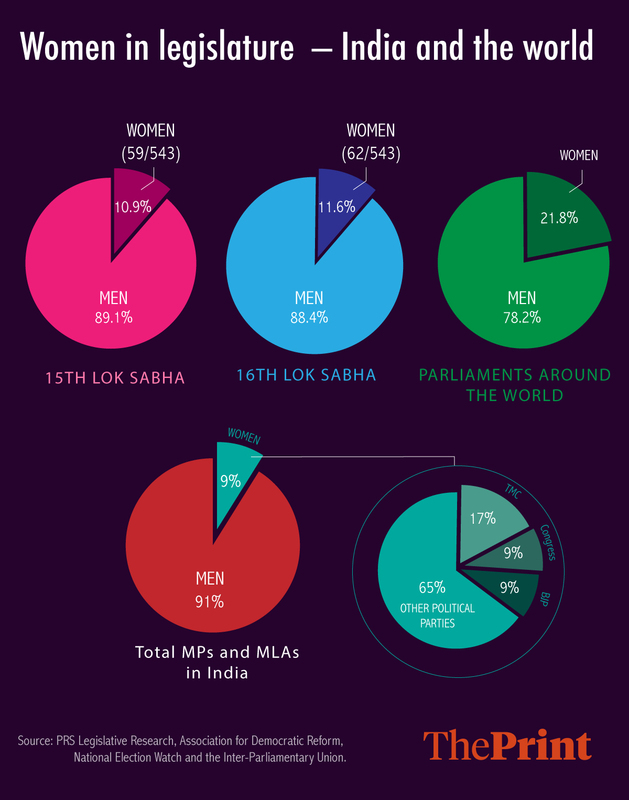 According to data provided by PRS Legislative Research, in the 16th Lok Sabha, there were 62 women MPs out of the total 543. The percentage of 11.6 per cent was slightly higher than the 15th Lok Sabha, which had 59 women MPs, or 10.9 per cent of the total strength of the House. If the 33 per cent reservation is implemented, the total number of women MPs in the Lok Sabha will increase to a minimum of 181. The percentage of women in state legislatures is worse than in Parliament. An analysis by the Association for Democratic Reforms and National Election Watch found that the combined representation of women MPs and MLAs was a mere 9 per cent. Globally, women’s representation is much higher than in India — the figure stands at 21.8 per cent, as per 2014 data by the Geneva-based Inter-Parliamentary Union. As of 2019, the BJP and the Congress have a total of 9 per cent women MPs and MLAs each. 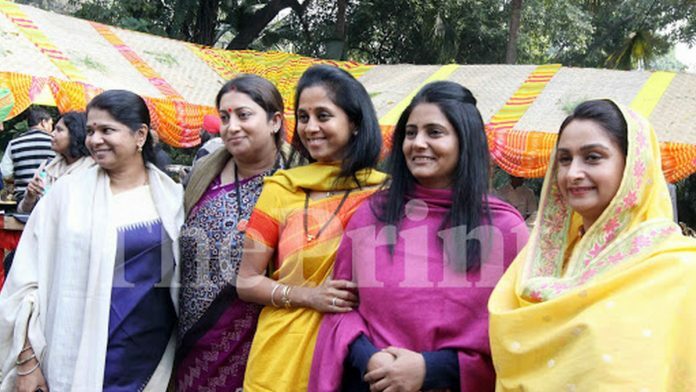 The Trinamool Congress has 17 per cent women MPs and MLAs. For the AIADMK, the combined MP-MLA figure stands at 10.4 per cent, while for Naveen Patnaik’s BJD, the figure is 10.2 per cent. Parties don’t even field too many woman candidates — in the 2014 Lok Sabha polls, only 38 of the BJP’s 428 candidates were women. The Congress gave tickets to 60 women out of 464, while the Bahujan Samaj Party fielded 21 women out of 503 candidates.